February 9, 2015 – Wemyss Malts is releasing six new single cask Scotch whiskies for the UK, European, and Asian markets. The casks were selected by the company’s tasting panel under the direction of veteran whisky writer and consultant Charles Maclean, with names that reflect the character of each cask. 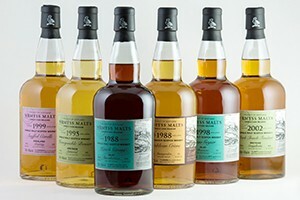 Recommended retail prices for the six bottlings range from £65 to £130 GBP ($99-$200 USD).